GARBAGE!!! AND JENNIFER LAWRENCE IS UGLY!!! My favorite love story in the universe! I used to love Titanic the most, but I absolutely love this romantic spaceship one better. Entertaining movie with a believable story line and above average acting. I was impressed with the realistic set designs of what an interstellar space craft might look like, inside and out. Definitely one of the better sci-fi movies of the year. Really fun movie. Lawrence and Pratt are such versatile actors and really make you feel their emotions. Pratt's humour translates so well giving him a realistic and believable character. Special effects, storyline, characters and script were fun and exciting. The only reason I didn't give it 5 stars was, that I felt the ending was a bit lacklustre and disappointing. I encourage anyone who likes these two talented actors, sci-fi and incredible special effects to watch! Pretty good movie, laughs, action, not bad. Best Sci-Fi movie we have seen in a long time ! Fantastic !!!! THIS WAS A VERY NICE MOVIE. I WAS VERY SURPRISED BY THE STORY. I had no expectations going in except that I really like Jennifer Lawrence, Chris Pratt and Lawrence Fishburn. The graphics were excellent and the story line was great in that it shows our human nature by letting our faults end relationships and not missing what we have until we stand to lose it. I want to see it again; loved it! great story and special effects. Wasn't what I expected but that's okay! It was still really great. It was an exciting plot and I never got board. I would recomend and I would watch again. GO SEE IT. Good movie and good animation and story. Great movie, excellent condition acting. This is a knock off of a Canadian drama called Star Lost. And it does a good job of taking off from that show. I loved the acting, I loved the love story, I loved the action, I loved the expansive scenes. In all it captured my heart and made me feel the intensity of their situation. I agree with other comments....JUST SEE THIS MOVIE. This was a love story not really a Sci-fi. It moved very slow. Great romance. Great special effects. Jennifer Lawrence is spectacular. I really enjoyed this movie,,so few actors and they really carried it off....good entertainment!!! An excellent movie more about moral issues than just a simple love story. Well worth the price of admission. I really enjoyed the movie and I can be pretty critical of them! :) I will say about 20 minutes before the end the movie seemed to speed up to get to the end and the acting and plot suffered a bit because of that but then after about 10 minutes they recovered and it went back to the original pace. It was an excellent story and well acted with the exception of 10-15 minutes. I would recommend as a theatre movie. Nice visual effect! Jennifer Lawrence acts great! OK - first off, I had to get over the obviously weak idea that once woken from hibernation sleep, you could not be put back into it. That just doesn't make sense. The crew would need to be awoken for any potential emergency and then put back into hibernation. But put that aside, and it is a great movie about loneliness, life, purpose and relationships. For once, a movie that does not move along at break neck speed (until the end crisis) jumping from ridiculous action to ridiculous action. This film allowed us to wake up and experience this 1 Km long "world" along with the actors at a proper speed. Loved it. Whow this was an amazing movie. Very crisp and clean..Terrific acting etc. I don`t usually rate movies this high but This was a gem ! no complaints. Jennifer L. is incredible.. Please don't listen the bad reviews, they don't understand the meaning of the story. The subject of this movie reminded me the poem: "Life Is a Journey, Not a Destination." This is my best movie! The actors are great, the story is amazing, the picture and cinematography are great too. This is a movie you should see to start the new year in a positive journey. It's not boring - it's funny, romantic, and has a smidgen of action at the end. It's not typical Hollywood. What would prompt you to leave everything you know to go on a great adventure in an unknown future? This is the primary premise of Passengers, one, which is followed by a cascade of choices that passengers must make as they hurtle through space on their rendezvous. 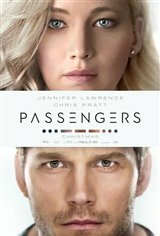 Both Jennifer Lawrence and Chris Pratt bring their considerable acting skills and presence to this morality tale, which asks the audience the question: what really is the core of our decisions that ultimately determine our destiny? This is a layered drama which sees Lawrence giving a memorable performance and engages an audience with more than just spectacular vistas. A great script by Jon Spailhts, beautifully acted by two superstars of modern cinema. A big two thumbs up for a Science Fiction Drama that speaks to the essence of the human experience. There are a lot of negative reviews for this film but we both really liked it. It was like it was done in three acts, each building on the last. The tension in the end gripped us and the actors had a real chemistry all the way through. No problem giving this five stars. This movie touches on the many aspects of being human. This is a wonderful movie! It struck the perfect balance of science fiction and romance! Both my husband and I really enjoyed it. We highly recommend it. The story line is compelling. The visuals are beautiful. Yes, the movie stays with you, a long time after leaving the theatre! It is wonderful! Really liked it. The ship itself was amazing eye candy and technology - but in the end it was about two human beings trying to survive a lethal environment due to damage to the core reactor. The chemistry between Jennifer Lawrence and Chris Pratt was excellent. This one stayed with me for a long time afterwards and posed some deep questions of what mankind is doing in space in the first place. It was a true trip into outer space. Really, the special affects where out of this world and it had a very good story line. The ending was left a bit up in the air and unfulfilled but it was a well worth experience. I will be going back to see it again and I don't often do that. Great sci-fi flick with fantastic cgi and special effects. Imagine traveling to a new world "failsafe". I'm surprised by some of the negative reactions to this movie. I loved this movie much more than I expected. Maybe not the deepest sci-fi, but with charismatic actors and great set design, I was pulled right in. Nice love storie well done. A decent love story with a little science fiction thrown in. Definitely not what was expected from the previews. A love story where love conquers all. The theatre where it was shown gave one option at 6:40pm, the 2-D version, not good. The 3-D version was shown at 10:10pm so the managers cut their own throats attendance-wise. But the movie, looks good in 2-D should be much better in 3-D. The line which summarized the plot best was, "Jim! Come back to me! I can't live on this ship without you!" Somehow Adam and Eve were reborn in space, complete with the tree of knowledge. See the 3-D version, I was not given that option. Not a good movie, lack of storyline. The ending does not make sense, leaves the audience wondering. Very slow, no action. Poor acting by both actors. The visual effects are astonishing and the story is believable. I enjoyed this movie. It was a "grown-up" science fiction movie. The two main characters were delightful. It was very entertaining. Certainly one of the best sci-fi's I've seen this past year. Kudos to the writers! The movie had lots of potential...story just ok...decent acting....great effects per today's movies but just lacking overall. trailer was really misleading, more of a chick flick, wasted my money! Slow. Boring. Minimal action that lasts like 15 minutes. The story is ok, but just boring. Not theatre worthy.